Here’s a suggestion for you… software application developers should be looking at the technical newswires to gauge where the global interconnection pipes of the web are going to next strengthen up in order for them to target specific international application development. It sounds far fetched, but it’s not. SACS has been established by Angola Cables, probably everybody’s favourite Luanda, Angola-based advanced submarine telecommunications systems company. 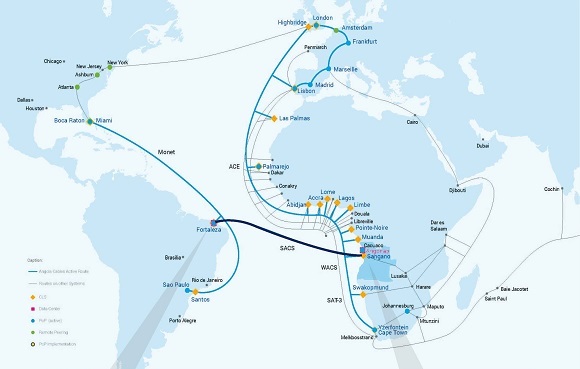 The new web highway was manufactured and powered by NEC Corporation and, under the management of Angola Cables, it now exists as a commercial operation connecting Angola (Africa) and Brazil (South America). According to the company, data transfer speeds will be improved (five times faster than existing cable routings), reducing latency from Fortaleza (Brazil) to Luanda (Angola) from 350ms to 63ms. Luanda, will also connect to London and Miami with approximately 128 milliseconds latency. These two major content hubs will position Angola as a strategic point to serve the transatlantic region with low latency and resilient connections. António Nunes, CEO of Angola Cables said that the commercialization of the cable is “more than just a game-changer” when it comes to data connectivity and services between the two continents. “By developing and connecting ecosystems that allows for local IP traffic to be exchanged locally and regionally, the efficiency of networks that are serving the Southern Hemisphere can be vastly improved. As these developments progress, they will have considerable impact for the future growth and configuration of the global Internet,” says Nunes. SACS is 100% owned and managed by Angola Cables has been designed with 100Gbps coherent WDM technology. The global scope of web interconnectivity and the degree to which latency exists is (very arguably) of huge importance as we now approach real-time application analytics that demands millisecond response time, especially in areas like log file analytics and application orchestration and monitoring. The Internet has to join the dots and get bigger, stronger, faster and better… so Angolan telco connectivity could be affecting more than you first thought.